The Seabury investigations were prompted by allegations of lurid and endemic corruption within the police and lower court systems. The Seabury investigation into the Magistrate’s Courts revealed a shocking picture of conspiracy among that Court’s judges, attorneys, police and bail bondsmen to extort money from those facing trial. The Magistrate’s Court of the City of New York was the Court in which those people charged with certain crimes first encountered the justice system. Throughout the autumn of 1930, the Seabury Commission heard more than 1,000 witnesses — judges, lawyers, police officers and former defendants — paint a shocking picture of false arrests, fraudulent bail bonds, and unjust, peremptory imprisonment. Many people - often women, always working class - who were charged with crimes in the Magistrate’s Court were totally innocent of wrongdoing, “framed” in police parlance, by lying police officers and police-paid “witnesses.” The victims usually knew no lawyers and could not afford private counsel. Victims were made to understand that conviction and a prison sentence were a foregone conclusion unless money was paid through certain attorneys to court personnel, police and others. The conspiracy had been highly effective. Innocent people either parted with their life’s savings or faced prison sentences, the women often on spurious convictions for prostitution. It was discovered, during the investigation, that 51 young women had been illegally confined in the women’s prison at Bedford. As a result of the investigation, formal charges of corruption were brought against many involved in the scheme. The Appellate Division ordered the dismissal of corrupt judges. Later, when Mayor Jimmy Walker reneged on his agreement to pay the Commission’s cost, a writ of mandamus was brought before the Appellate Division, which ordered the mayor to pay. The Seabury Commission’s work resulted in a massive shake-up of the lower court system, and the resignation of Mayor Walker. Through the 1930's, under the stewardship of Mayor Fiorello LaGuardia and planner Robert Moses, the growth of the City accelerated. The decades also saw the Appellate Division deal with international issues, including the rights of New York plaintiffs against governmental authority in Soviet Russia. One plaintiff brought suit against the “Government of Commander-in-Chief of Armed Forces in South of Russia,” a de facto government against which, the Court held, no enforceable right or remedy existed in New York. Another case, involving the Standard Oil Company, held that the Soviet nationalization of oil property was not subject to attack in the New York courts. 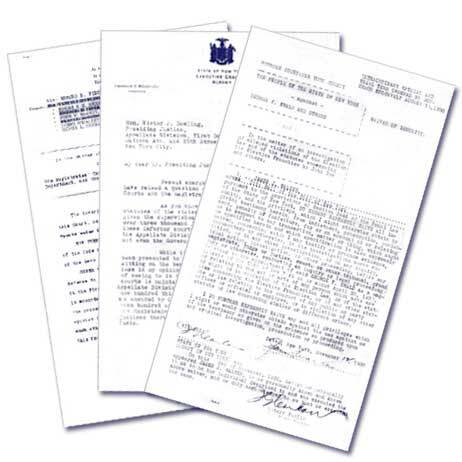 Documents from the Seabury Investigations. Third Avenue Elevated Train platform.